Happy Eunice Kennedy Shriver Day 2016! Eunice Kennedy Shriver wrote this down on the morning of July 20, 1968, the day of the first Special Olympics International Games. 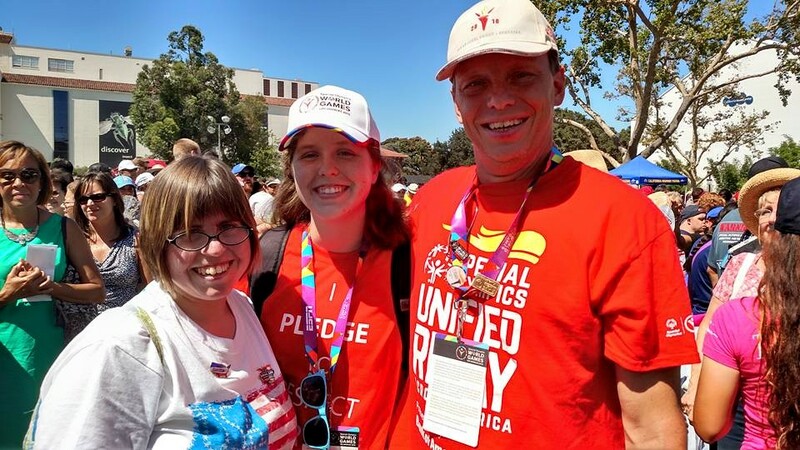 She spoke the oath at the Opening Ceremony, and ever since, Special Olympic athletes have been pledging it at every Special Olympic competition. Today is the seventh annual Eunice Kennedy Shriver Day! We celebrate this every year to honor Eunice Kennedy Shriver, the founder of Special Olympics. She changed the lives of athletes with intellectual disabilities by providing them with a way to train and compete in sports, and she changed the lives of everyone in the world by creating a way for inclusion. To me, every day is Olympic Day (especially when it’s one more day until I leave for Rio! ), but Olympic Day is also a day celebrated every June 23 to commemorate the birth of the modern Olympic Games in 1894. Every year from May 31 to June 30, communities and programs around the United States organize events to celebrate the day. 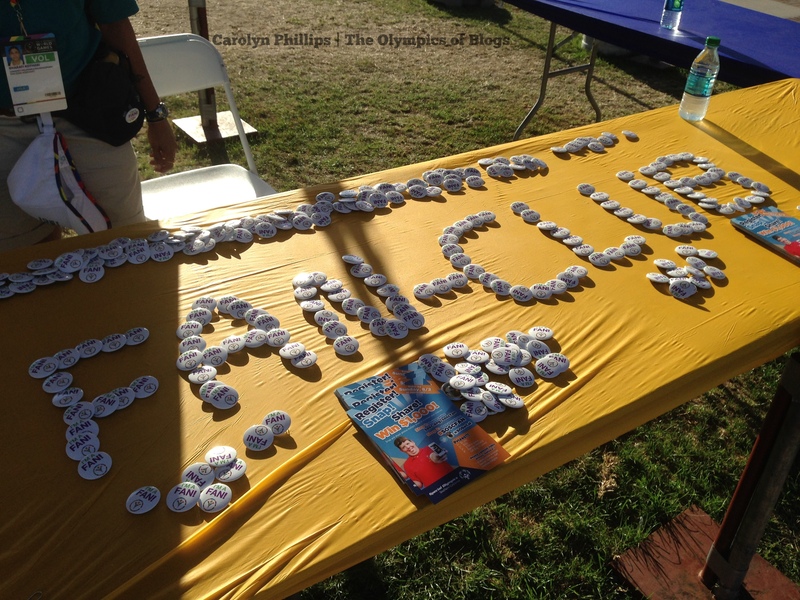 Before my internship at LA 2024, I had never been to one of these events. 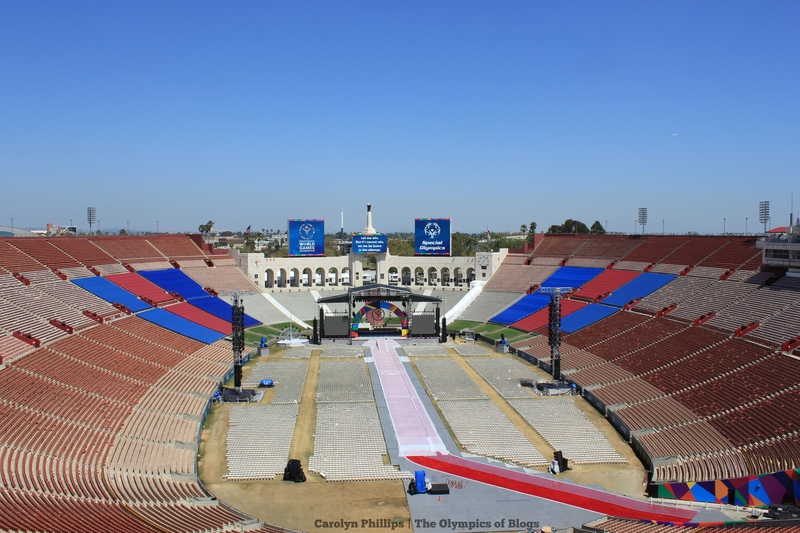 On Thursday, June 23, the LA 2024 Olympic and Paralympic Bid Committee and the LA84 Foundation, which was formed with the profits from the 1984 Los Angeles Olympics, hosted an Olympic Day celebration in the Los Angeles Memorial Coliseum. Over 500 youth in the Los Angeles community came, and after the Opening Ceremony, they were able to learn and play Sitting Volleyball, Volleyball, Archery, Rugby, Soccer, Fencing, Rowing, and Badminton. The Opening Ceremony, staged in front of the Memorial Coliseum, featured LA 2024 Chairman Casey Wasserman, LA 2024 Vice Chair and Director of Athlete Relations Janet Evans, and LA84 Foundation and CEO Renata Simril. After the Opening Ceremony ended, the cauldron ignited, and a day of Olympic Spirit began. We started the day off by arranging all of the students into the Olympic rings, which was kind of difficult but very cool. After creating the rings, each group went off to its station to learn the rules of the sport and try it out. During the day, I was also able to learn a few new sports. I tried Sitting Volleyball, a Paralympic sport where competitors are only allowed to sit on the ground while playing. This was so much fun! I never enjoyed playing Volleyball in gym, but I really liked this. I also learned a little Fencing from a very energetic coach. Before this, Fencing always seemed too foreign for me to understand, but she broke down how to play it for me. Although it was really hard (so much to think about! ), I enjoyed the little private lesson, and I would like to try Fencing again. I’m really excited to watch Fencing at the Olympics because now I have a little more understanding of the sport and how it feels to do it. Toward the end of the day, I tried Rowing. Because they weren’t able to bring a place where you could actually row onto the field of the Coliseum, they had rowing machines set up. I had used them before in high school gym class. Now I know what they’re really meant for because the person at that station talked me through what the motions on the machine stimulated in actual Rowing. This day was really fun, and it made me very excited for the start of my internship. 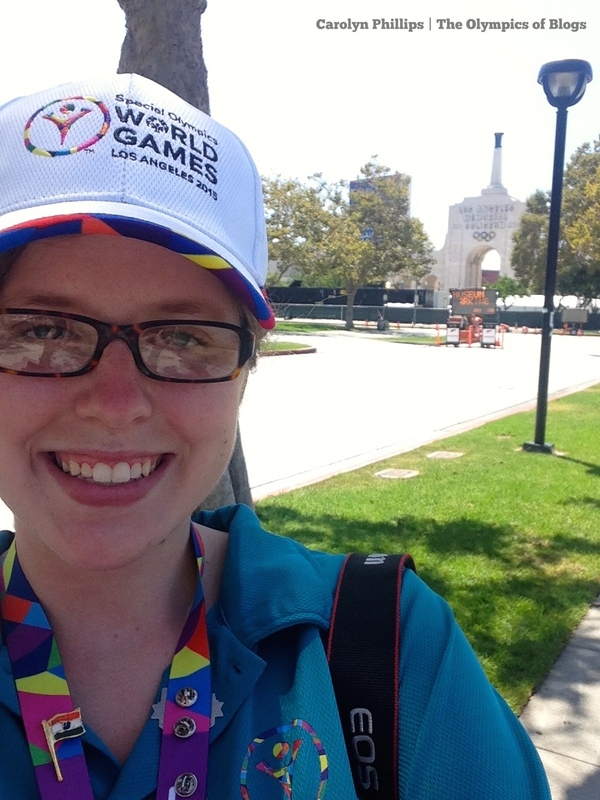 A little less than a year ago, I had been in the stands of the Coliseum watching the Special Olympics Opening Ceremony happen on that same field where I stood on Olympic Day. While watching all of the kids try out different Olympic sports with the cauldron burning above the field, I was really inspired. It felt right for Los Angeles, and it felt right for me. 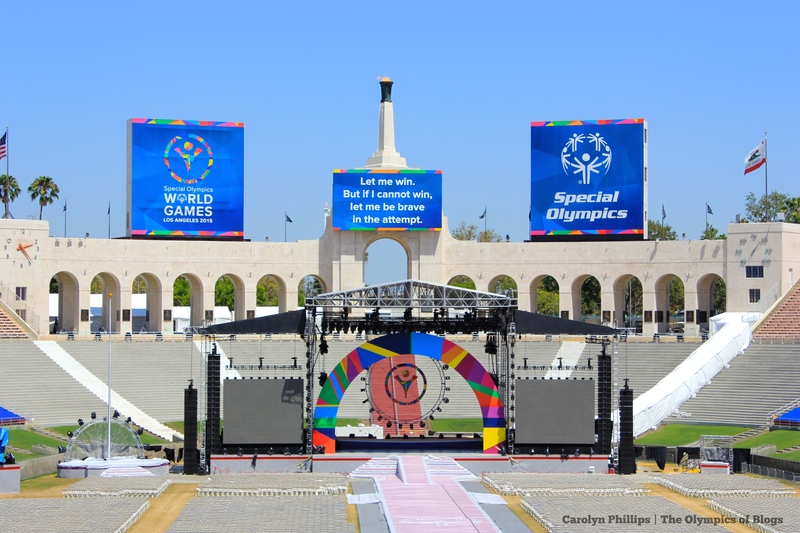 The cauldron of the Los Angeles Memorial Coliseum, the place where the 1932 and 1984 Olympics, the 2015 Special Olympics World Games, and Olympic Day began, will hopefully light up at the Opening Ceremony of the 2024 Olympics, and maybe some of the students from Olympic Day 2016 will be there competing. For faster updates while I’m at the Olympics, follow the Olympics of Blogs on Instagram @theolympicsofblogs. I leave on Monday! Yesterday was my one year anniversary for volunteering with Special Olympics. 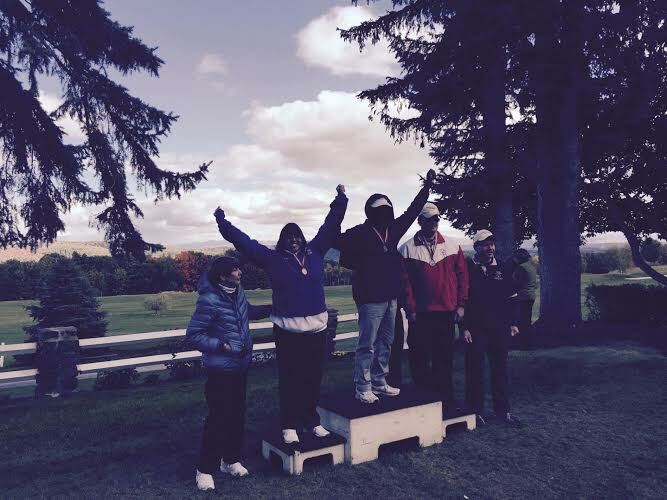 On February 6, 2015, I began my Special Olympics journey at the 2015 Winter State Games in Syracuse. On that day, I helped put up arenas for Floor Hockey and watched my first ever Opening Ceremony. 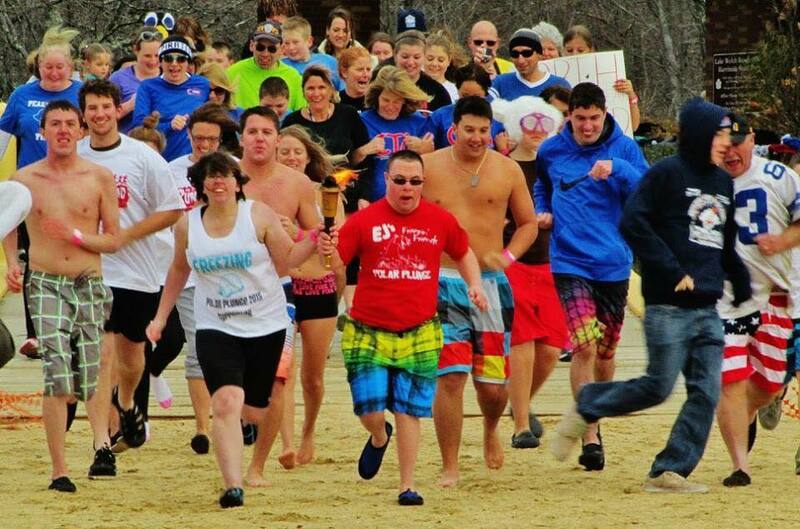 It has been a really special year since then, and it’s all because of Special Olympics. I’m so happy that I’m a part of the Special Olympics family, a family of truly inspiring individuals who love the Olympic Movement just as much as I do. 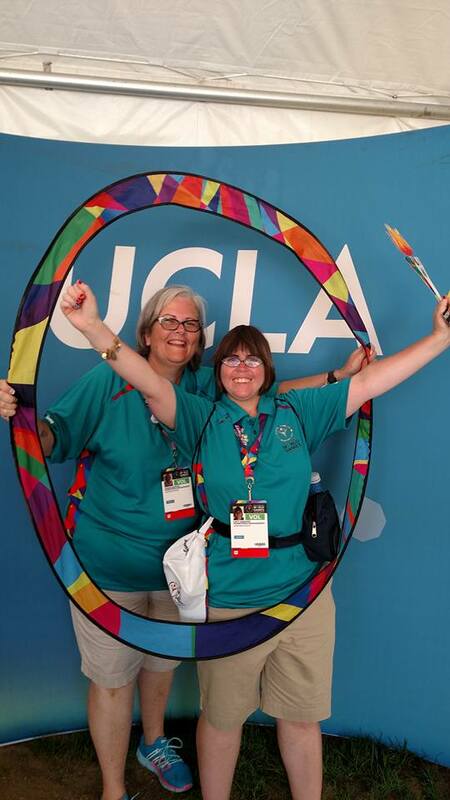 From the employees at Special Olympics New York to the athletes to the volunteers in New York and LA, Special Olympics constantly reminds me that the world is full of good people. It pushes me to want to be a better person, and it makes me happy to see the athletes compete and succeed over hurdles in sports and in the world. One of my favorite Special Olympics memories from the past year happened at a Basketball Skills competition. One of the athletes, the self-proclaimed Gold Medal Ted, asked my supervisor and I if he could sing, and it was decided that he could sing during the Closing Ceremony. After the medals were awarded to the athletes, it was time for the Closing Ceremony to begin. Athletes like Ted make me so happy that I have had the opportunity to work and volunteer for Special Olympics. It’s an organization I believe in, and although I don’t know what I will do after I graduate, I know that I will always support Special Olympics. Here’s to another year! In my parents’ house in Pennsylvania, they have frames filled with pins right above the computer. For a long time when I was growing up, I had no idea what they were for. However, it all clicked one day, and I realized that these were the pins my family had collected when we went to the 1996 Olympic Games in Atlanta. I was one at the time, so I don’t remember it, but my sister says it was really awesome. She told me that her pins were coveted because my mom had gotten Kodak pins that no one else had. 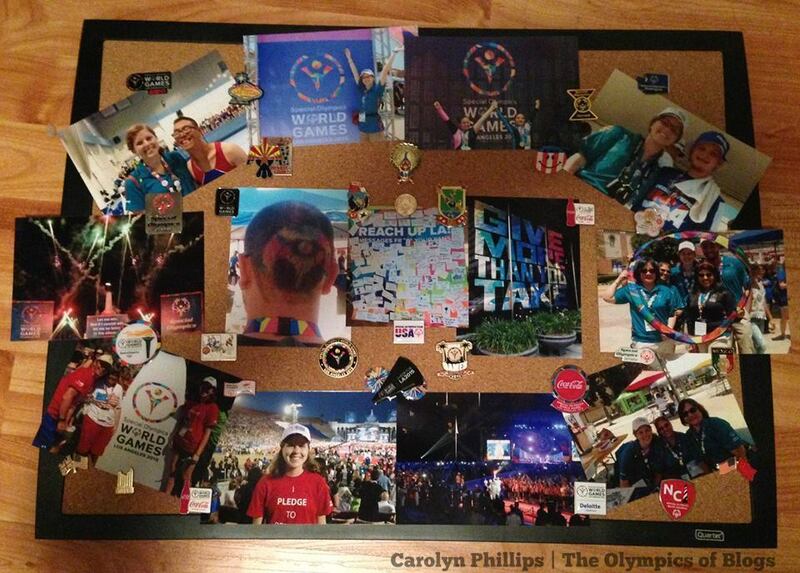 Although I missed out on the pin-collecting fun at the Atlanta Games, I was able to experience my own pin-collecting fun this summer at the Special Olympics World Games. 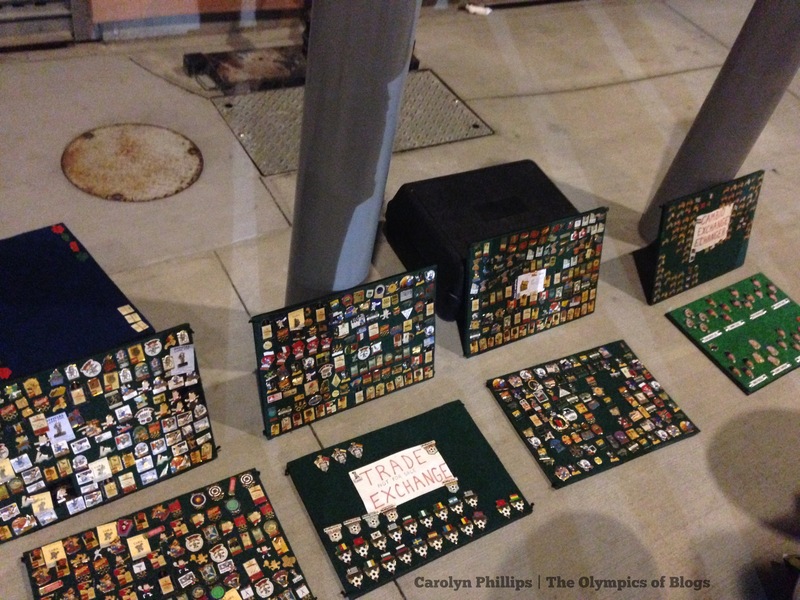 He was right outside of the LA Memorial Coliseum after the Opening Ceremony and would only trade for pins. People kept trying to buy them, but he kept refusing. 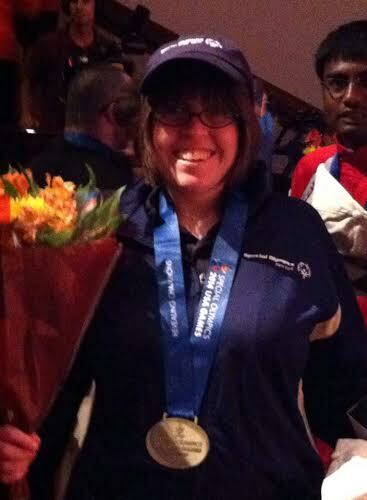 Amy, my supervisor at Special Olympics New York, gave me Special Olympics New York pins before I left. I’m so grateful that she did because I was able to trade those for really cool pins. Mine were highly desired because not many people there were from New York. 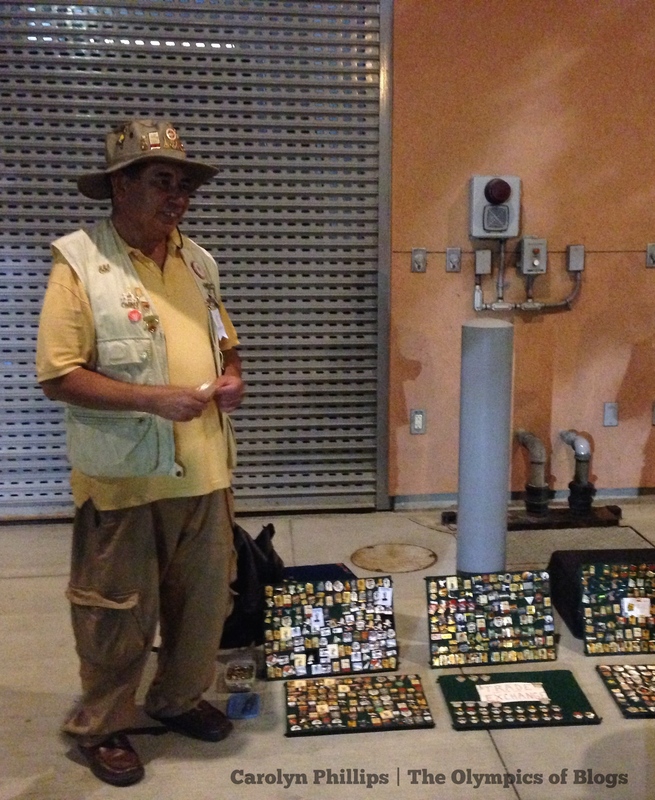 From my experience, trading pins was a way to open up conversation and connect with people from anywhere. The pins bridged the gap between cultures and languages. Most of the delegations had pins from their countries with them, and it was a good way to approach a team and get to know them. Special Olympics athletes are so kind that usually they tried to give me their pins instead of trading. I always had to make sure that they also got pins from me. One of the coolest pin tradings happened on my last night as a volunteer. I was already done with my shift, and I was saying goodbye to everything at UCLA’s Wilson Plaza with my friend I had made during the Games. A man and a woman approached me and asked if I wanted to trade with them. They ended up trading me pins from the Atlanta 1996 Olympics! I traded some of my pins for an Atlanta Olympic pin, Paralympic pin, and a Diving pin. As I was talking with them, they told me they were Olympic historians, and they had been to 18 Olympics in total. They had actually just returned from the Pan Am Games, which happened in Toronto this summer. I got some advice from them about Rio, and I said I would see them there! Pins from the Fan Zone. We were giving them out for free- no trading necessary! Thanks for reading! Please follow me for more updates on my Olympic journey! When I was in LA, Boston dropped out of the race to host the 2024 Summer Olympics, and it was rumored that LA would go for it. This ended up being correct! 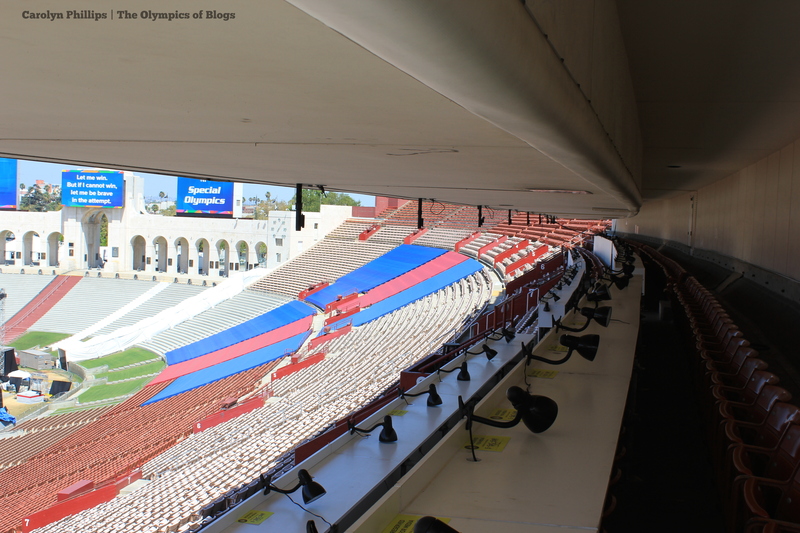 Because of this, I decided to go on a self-guided tour of the LA Memorial Coliseum. 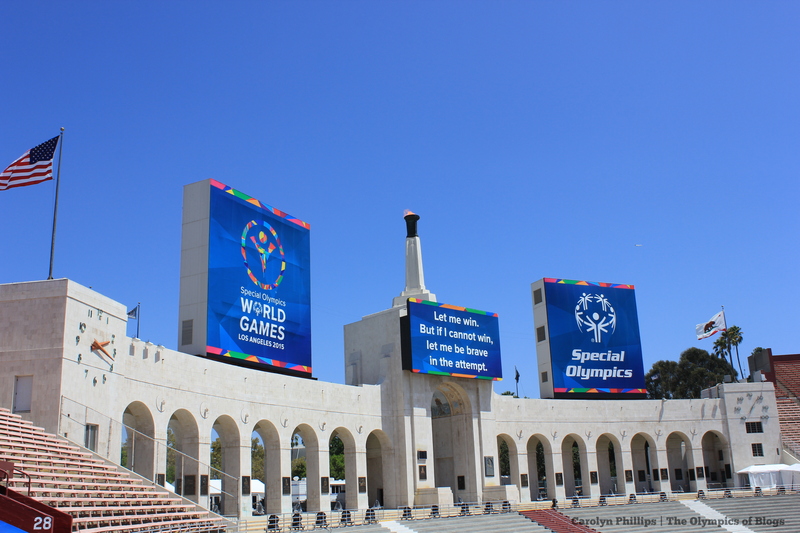 The LA Memorial Coliseum was the site of the Opening and Closing Ceremonies for the 1932 and 1984 Summer Olympics, the site of the Opening and Closing Ceremonies for the 2015 Special Olympics World Summer Games, and would be the site of the Opening and Closing Ceremonies for the 2024 Summer Olympics if LA is selected. 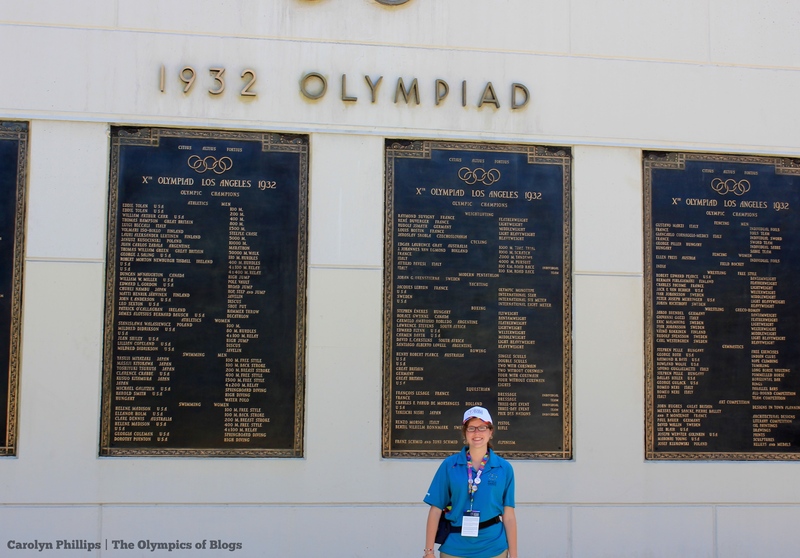 The LA Memorial Coliseum has so much Olympic history! I was so excited to tour this place. Unfortunately, I just missed the guided tour, but I actually think that the self-guided tour was better. I could walk wherever I wanted. Above is the view of the LA Memorial Coliseum while walking up to it. Although I knew the construction wasn’t related to LA’s Olympic bid (because it was happening before Boston pulled out), it still made me feel hopeful that LA 2024 might happen. It was obviously a good sign! On the right is a photo of me with the cauldron that was lit in 1932, 1984, and 2015! It is hard to see from my selfie, but that cauldron was burning brightly for the Special Olympics! While I was walking around, it was so inspiring to imagine how it felt in 1932 or 1984. I walked in through one of the stadium entrances, and there was this 1984 Memorial. It commemorated every athlete who won a gold medal in the 1984 Games. I was in awe standing in front of it. The people who were featured on this and had won gold medals had once stood where I was. 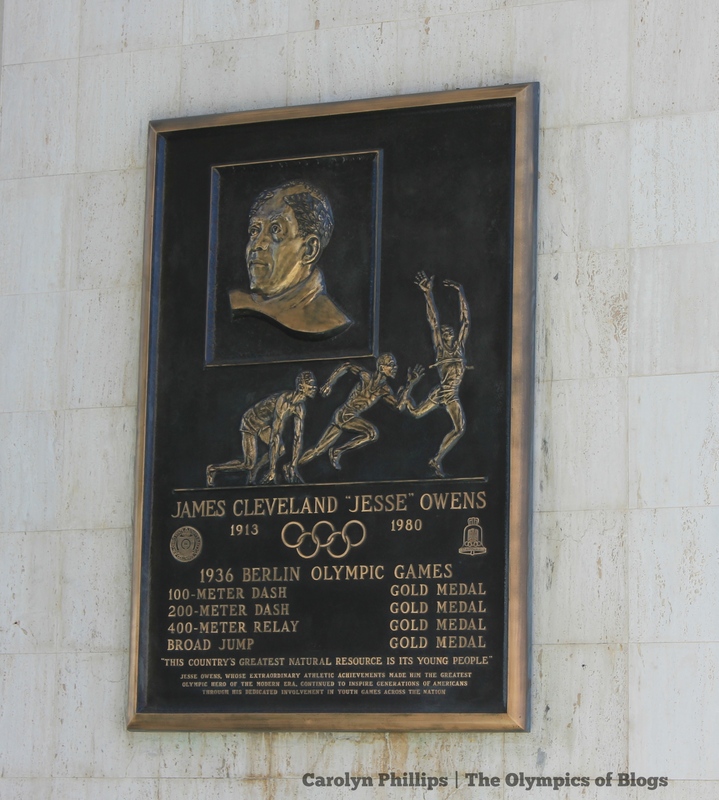 As I continued walking, I found this plaque commemorating Jesse Owens, one of the most inspiring Olympians ever. Even though he hadn’t competed in the 1932 Games, he was still remembered. It made me wonder if he has a plaque in every Olympic stadium and if he has a huge plaque in Berlin, the site of the 1936 Olympics (where he competed). After seeing those cool plaques, I began wandering around the stadium. It’s huge! My ultimate goal was to walk to the center of the stadium and go to the top. Here are some photos I took during my walk around the stadium. It was so amazing to sit up at the top and drink in all of the Olympic memories. I could easily imagine the entire stadium filled with fans who were cheering athletes. According to the University of South California’s website, there are 93,607 seats,and I bet all of those were filled in 1984 and 1932! Here is a view of the Downtown LA skyline from the top. It’s a little different from NYC’s skyline but just as beautiful! After sitting for awhile, I continued walking around the stadium. It was funny because I could see the guided tour as they moved around the stadium. They were moving pretty slowly, so it was easy to catch up with them. It was very tempting to subtly slip into the tour, but they were moving way to slow for me. I sat in one of the seats, and it had an awesome view. I continued walking, and I found another Olympic Memorial. This one was for 1932. I think that if I could have entered through the main entrance, the 1932 and 1984 memorials would have been on either side of me. 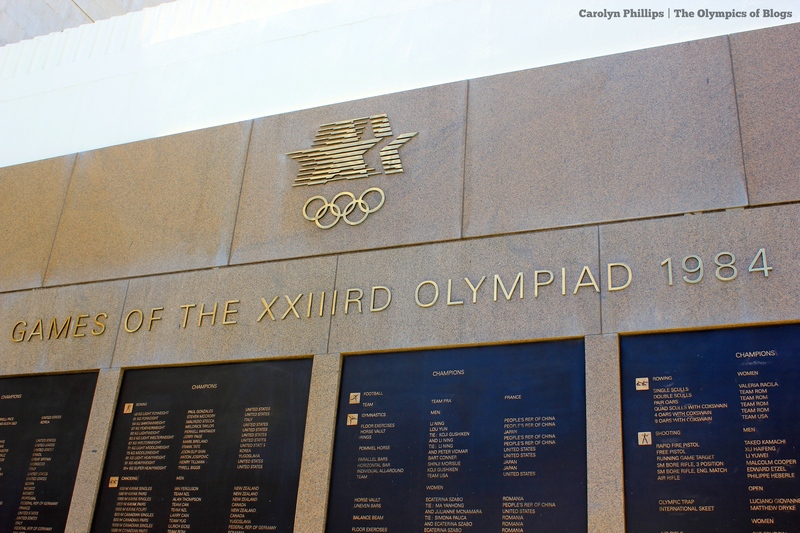 This memorial had all of the gold medalists of the 1932 Olympics. I managed to get a nice construction worker to take a photo of me in front of this memorial. It was very exciting to wander around the site of so much Olympic history. So many athletes had come through this stadium to have their Olympic moment. 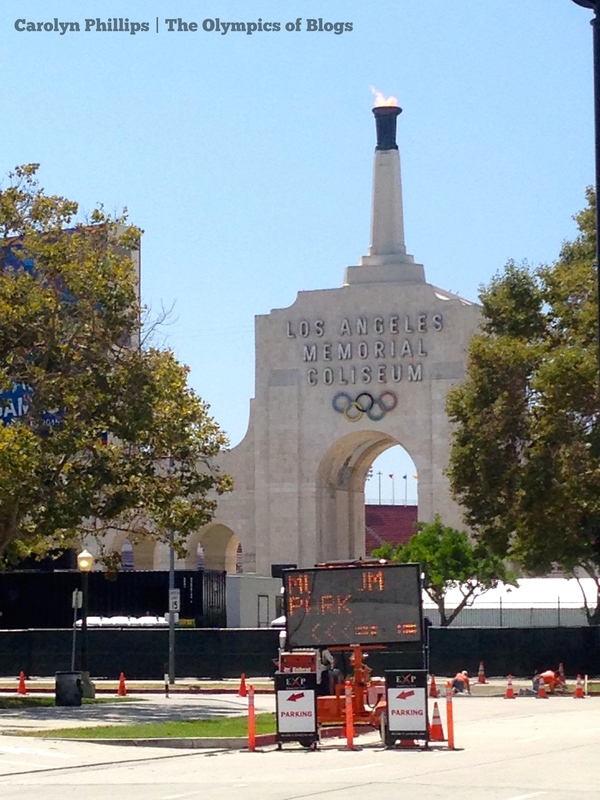 I really hope that the 2024 Olympic athletes can add to the history of the LA Memorial Coliseum. Fingers crossed for LA 2024!